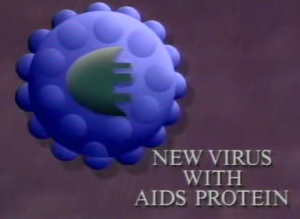 In the summer of 1989, two papers about viruses were published in high-profile journals. One described the engineering of a recombinant poliovirus bearing on its surface an antigen from HIV-1. The second paper claimed that transgenic mice could be made by adding DNA to sperm before using them to fertilize eggs. Both reports played a role in a television interview I did with Earl Ubell of CBS News. I was reading the Cell paper describing a new way to make transgenic mice when I received a call from CBS News. They wanted me to comment on a report that had just been released by the journal Nature, describing the production of a recombinant poliovirus bearing an antigen from HIV-1. When rabbits were inoculated with the recombinant poliovirus (the authors called it a chimeric virus), antibodies were made which could block infection with HIV-1. CBS wanted to talk because I had developed the technology to genetically engineer polioviruses. Within an hour, science correspondent Earl Ubell arrived in my lab with a camera crew. We chatted while they set up their equipment and began to record one of my postdoctoral fellows, Gerardo Kaplan, moving about the laboratory. Ubell asked me what I thought about the polio-HIV story. I told him that it was interesting but would probably not be useful for preventing AIDS because only a small piece of HIV-1 protein could be inserted into the poliovirus capsid. Then we started talking about the sperm – transgenic mouse story, which he had heard about. I was more positive about that story; I noted that the findings could revolutionize biology. In a few moments a microphone was clipped to my shirt and the camera began recording our conversation. Ubell began asking me questions about the polio-HIV experiment. We discussed how the virus was engineered, why it was possible to insert foreign protein into poliovirus, and the utility of this discovery. I was not positive about the future of this technology for vaccines, but I did point out its potential for research. His last question was about the sperm – transgenic mouse paper: what did I think about that? I responded, “I think that if this report is correct, then it’s going to be fabulous”. Then he packed up and left. Several weeks later one of my students sent me a copy of the final program that had been shown on television. I was surprised to find that just one of my comments was used, and it had nothing to do with the polio-HIV story. It was the answer I had given in response to Mr. Ubell’s question about the sperm – transgenic mouse experiment, which of course was not the topic of the TV piece. I don’t know who made the juxtaposition, but I found it duplicitous. As a result of this experience, for the next 20 years I limited my contact with journalists. Here is Mr. Ubell’s June 1989 report for CBS News. To his credit, he did get the science right, and he pronounced my name correctly. Unfortunately, while poliovirus antigen chimeras have been useful in the research lab, they have not been used as vaccines. And making transgenic mice by putting DNA into sperm turned out to be wrong. There is an interview with Christine Maggiore, who talks about her difficult decision to go against medical advice by refusing Aids medication, medication, and how much better she felt as a result. What the film doesn’t tell you, as you shout at the screen, is that Christine Maggiore’s daughter Eliza Jane died of Aids and PCP pneumonia three years ago, at the age of three, and, as I reported nine months ago, Christine Maggiore herself died two days after Christmas 2008 of pneumonia, aged 52 (the film finally acknowledges her death in the last 2 seconds of the film, at the end of the lengthy credits, in small letters). As Christine Maggiore's investigator, I've reviewed all of the paperwork regarding the case. Where did you get your information? By the way, did you know prosecutors reduced a potential 15-year sentence for allegedly spreading HIV to five days of unsupervised probation after they learned that they had to prove HIV attacks cells and causes AIDS. Propaganda like this simply doesn't hold up in court. After nearly 30 years and thousands of criminal investigations, I look forward to putting HIV on trial. When outspoken AIDS activists Martin Delany, Hank Wilson, Ferd Eggan, Belynda Dunn, Joe Carroccio, George Sanderson and Howard Jacobs died, their cohorts hardly mentioned that they all succumbed to drug-caused liver cancers. But when outspoken HIV skeptic Christine Maggiore passed away in December 2008, Seth Kalichman, John Moore, Jeanne Bergman and other PharmaSluts falsely marketed her death as AIDS-related. For nearly a year, they parroted the false claims on thousands of heterophobic blogs – most of which are directly or indirectly funded by the pharmaceutical industry. For example, a visit to The Body will cram your browser with drug advertising and gay activism. For an industry that routinely spends billions settling criminal complaints and pushing deadly drugs to children and minorities, disinformation is a vital component of their marketing plans. Without this propaganda and the complicit media, Americans would know that infectious diseases (including HIV) are statistically irrelevant in the US, Europe, Australia and South Africa. We would also know that millions of Americans are injured or killed each year by untested drugs, preventable medical errors, adverse drug reactions by the pharmaceutical industry’s ongoing criminal behavior and systemic incompetence. If the Media regularly reported these facts, taxpayers would not waste billions of dollars on the CDC, NIH, research centers and universities that market unproven cures for mythical dangers like H1N1, HIV, HPV and CO2. Christine suffered fatal renal failure caused by antibiotics, antiviral, and calcium received during the 9 days prior to her death. So it’s no surprise that, despite his considerable qualifications, the PharmaSluts have attacked Dr. Al-Bayati as unqualified, although few (if any) of his accusers have ever qualified in a real court to render evidence-based opinions. Not only does Dr. Al-Bayati routinely qualify as an expert in criminal matters throughout the US, but he routinely exposes flaws in medical evidence that would otherwise be used to convict innocent people. Like AIDS activists Martin Delany, Hank Wilson, Ferd Eggan, Belynda Dunn, Joe Carroccio, George Sanderson and Howard Jacobs, Christine did not die from AIDS… she died from an adverse drug reactiuon – just like millions of Americans each year. Like ALL HIV-related papers, this one only ASSUMES that HIV attacks cells and causes AIDS – a problem cited by Peter Duesberg in the Proceedings of the National Academy of Sciences but never answered except in blogs like this. Before we explore a cure for HIV, it would be helpful if Professor Racanniello could explain 1) exactly how he would isolate HIV, and 2) prove HIV attacks cells and causes AIDS. Once he's answered this he can tell us who or what team accomplished this and what this proof was memorialized. Until causation is established, any discussion of what and how HIV allegedly does what it does seems somewhat pointless. Whatever you are you’re not a scientist. It’s patently clear to anyone with basic scientific training – I have a BSc in Physics with Astrophyics – that the whole field of virology is on the level of a cargo cult science. HIV has never been isolated and purified let alone proven to cause the 30 disparate plus diseases categorized under the umbrella of ‘AIDS’ it’s lunatic following professes it to cause – all diseases were well known and understood before the invention of HIV. It’s a disgrace that people like yourself are free to perpetuate this nonsense. You should be locked up and the key thrown away. If there is a God you have serious problems in your next existence.